In a significant shift, the Marine Corps has replaced a full infantry battalion in Afghanistan with a single company — another sign that a drawdown in forces there is well underway. Third Battalion, 3rd Marines, out of Marine Corps Base Hawaii, returned home over the last week from Helmand province. They’ll hold a ceremony early Thursday to mark the end of its last combat deployment in Iraq and Afghanistan, according to this report. The battalion was replaced in Afghanistan’s Garmser district by Kilo Company, 3rd Battalion, 8th Marines, out of Camp Lejeune, N.C. The district was the site of heavy combat several years ago, but was identified as a region where Afghan forces could take the lead providing security this year. Maj. Sean Carroll, 3/3’s executive officer, said in a Marine news release that the battalion demilitarized or transferred 39 of its 42 positions to Afghan forces during its deployment. It also shifted $140 million in gear back to the U.S.
“We needed to expand our battlespace, retrograde gear, and build, transfer and close positions while verifying the Afghan forces were ready to defend Garmsir as a whole,” Carroll said. Two Marine-led police academies in Garmser grew the Afghan Local Police from 120 to 369 patrolmen, Sgt. Phillip Kilgore, a police adviser, said in the release. The overall amount of Afghan police in Garmser doubled to more than 600. Coalition forces also shifted an Afghan National Army kandak, or battalion, from nearby Marjah district in February, giving Garmser two ANA units, Marine officials said. It seems likely that several other unit rotations in central Helmand will yield signs of the drawdown. For starters, while Kilo Company has taken over for 3/3, another unit — Lejeune’s 2nd Battalion, 6th Marines — now oversees the battlespace in both Garmser and neighboring Nawa district, Marine officials said. Third Light Armored Reconnaissance Battalion, out of Twentynine Palms, Calif., also recently replaced 1st LAR, out of Camp Pendleton, Calif. LAR units have patrolled the open desert in central and southern Helmand, using Light Armored Vehicles primarily in Khanashin and Dishu districts. The other major unit currently in central Helmand is Lejeune’s 2nd Battalion, 9th Marines. They oversee Marjah district, which also is scheduled for transition this summer. There are currently less than 16,000 Marines in Helmand, down from about 21,000 last year. 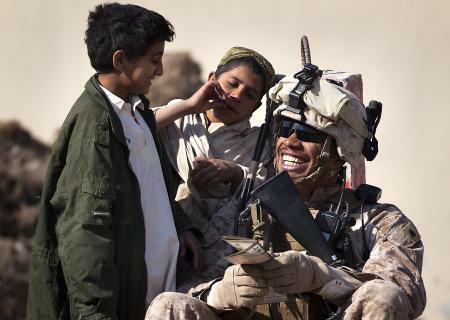 Maj. Gen. John Toolan, the previous Marine commander in Helmand, told us in March that there could be as few as 7,000 Marines in Afghanistan by the fall. Early this month, Toolan’s replacement, Maj. Gen. Charles Gurganus, declined to say how quickly the drawdown will occur, but acknowledged significant transition is ongoing.